We’re nearing the end of the crafts for our preschool alphabet book, can you believe it?! This has been a huge project, but we’ve finally reached the last two letters! The uppercase letter Y is up this week and while the letter Y can sometimes be a bit tricky for little ones, the three-year-old actually wound up loving this one. He’s kind of cute right?! Well, we thought so anyway. As always, you’ll start off by cutting out your pieces. 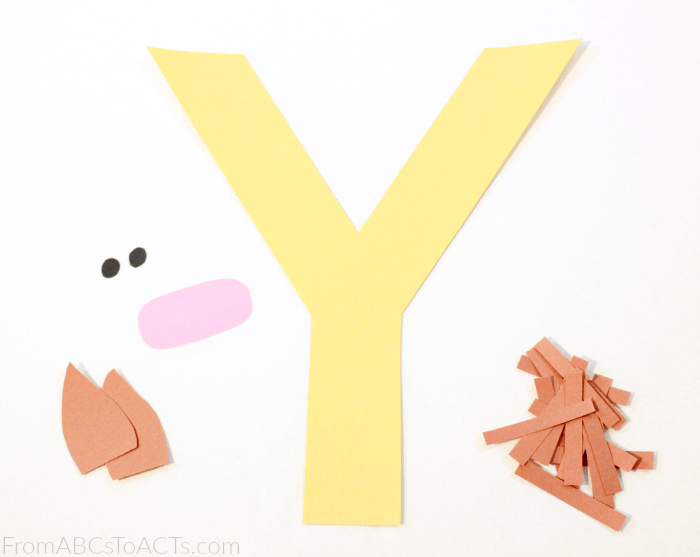 Although it looks a bit more yellow in the pictures, we used the tan colored construction paper for our uppercase letter Y. The brown was used to create ears for our yak as well as thin, short strips that we’ll use towards the end for a little fur. From the black, cut two small circles and from the pink, a long, rounded rectangle shape. Also from the brown construction paper, cut a large tear drop shape and then cut off the triangle tip as shown in the picture above. This will make the head of your yak. To assemble your yak, have your child glue the bottom half of their brown tear drop shape, upside-down on their sheet of card stock. On top of that, have them glue their uppercase letter Y with the bottom of the letter lining up with the cut end of your brown shape. Now it’s time to start adding some details! Glue your small black circles onto you pink rectangle shape and then add it to the base of your uppercase letter Y. Next, add the ears on either side of the top of your letter Y. And then finally, grab your short brown strips and glue them down right in the middle of your letter Y to give your yak a little bit of fur or hair as far as the three-year-old is concerned. When you’re all done and you’re just waiting for the glue to dry, grab the printable uppercase letter Y page below and when you’re done, add them both to your alphabet book!